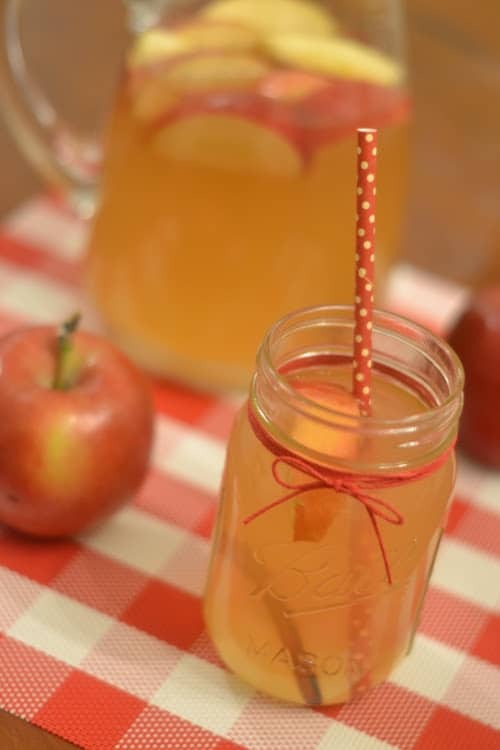 Give your body a boost with this Apple Cinnamon Detox Water, that Dr. Oz recommends. Just three ingredients needed to create water to boost your metabolism, flush toxins, boost immunity and more. Plus this apple cinnamon water is rather delicious and enjoyable! The combination of apple and cinnamon paired with water gets transformed into tasty detox water. No need to spend tons of money making this at home for dollars. Grab your Instant Pot or Ninja Foodi and have this infused apple cinnamon water to sip on. If you don’t own either I will share how to use the slow cooker method below! 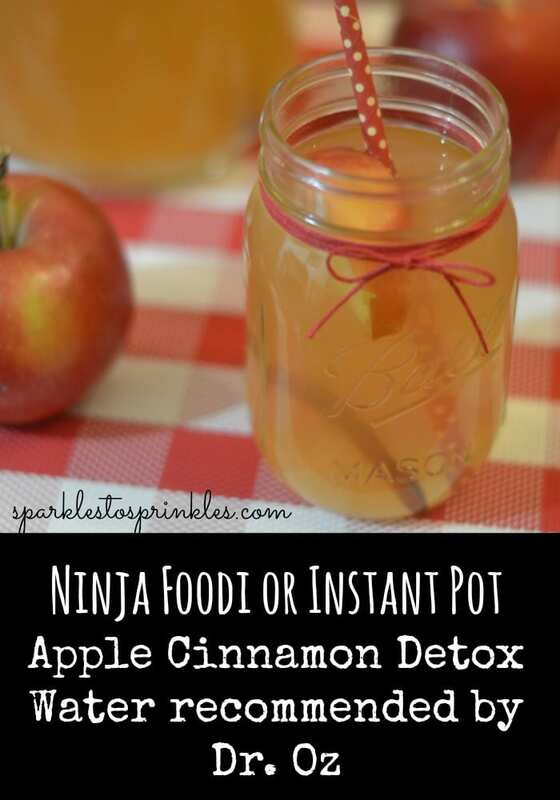 I have made the stovetop method, and I am happy to say the Instant Pot and Ninja Foodi method offers a more vibrant flavor within the drink that really pulls out that cinnamon flavor next to the apple. It is recommended to drink at least 8 oz with each meal. If you miss, say your lunch drink that is okay. Just try to aim to drink 2-3 times a day if you can. Keep apple cinnamon water in the fridge for no more than three days, than start a new batch. After the three day time, the water will begin to go wrong. If you do not have cinnamon sticks, you can substitute about 1/2 teaspoon of ground cinnamon in replace. You will just need to stir well before pouring a glass as the cinnamon will separate from the water slightly. It will also offer a different texture, then using cinnamon sticks. Can Cinnamon Help with Weight Loss? Cinnamon is known for helping to lower your cholesterol LDL, which is your bad cholesterol. Just like lemons, cinnamon can help boost your metabolism and help aid in weight loss. While it is not a guarantee, it is worth trying to see if you can benefit from the Detox drink. Give this detox water a try, and let me know how you like it and if you gain any benefits. We love having this on hand in our fridge, and it is refreshing and a great way to detox your body regularly! Need more reasons why you need to be sipping on this drink? Here are some of the incredible reasons as to why you should make up a batch and start drinking it today. As you can see this is affordable, easy to make and an incredible way to detoxify your body and help give your immunity a boost! 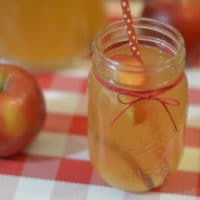 Give it a try and let me know what you think about this tasty apple cinnamon water. I love having this on hand, I find myself missing it when I am out. Have you tried an apple cinnamon detox water before? Pour water into your pot and put on saute to start heating while you are preparing your apples. Add apples and cinnamon sticks to your water. Pour over a mesh strainer or cheesecloth. Pour 8 cups into a pitcher. Put fresh apple slices from 1 apple & 1 cinnamon stick. Refrigerate. Pour 8 cups into a 2nd pitcher. 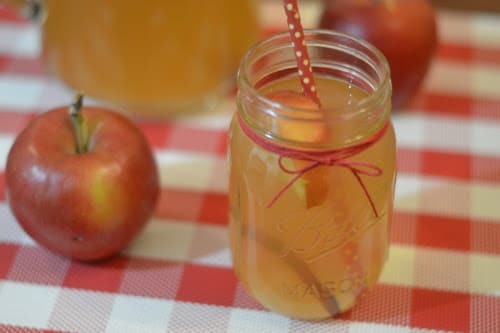 Put fresh apple slices and cinnamon stick in the pitcher when you are ready to start drinking it. Refrigerate.